MOSCOW, December 12. /TASS/. Russia is prepared to offer its customers the most advanced equipment and gear for fighting against terrorism, Russian President Vladimir Putin said at a meeting of the commission for military-technical cooperation with other countries on Monday. “We are prepared to offer our customers the most advanced anti-terrorist means,” the Russian leader said. He went on to say he was referring to not just means of close combat, but also military aircraft, air defense weapons, rocket launchers and armored vehicles. “In a word, everything that helps successfully fight with terrorists, who in fact created large, well-organized armed groups and often use well-trained specialists with a record of service in the regular army, and advanced weapons, including those of western manufacture,” Putin said He drew attention to the fact that Russia was making a tangible contribution to struggle against international terrorism and to enhancing the defense capability of its allies, including CSTO allies and CIS partners. The geographic range of supplies keeps expanding. Of late, whole regions of the world confronted soaring violence and terrorist threats. He mentioned Syria, Libya, Iraq and Afghanistan as examples. Russia is facing a misconduct of a range of countries on the global arms market and this needs to be taken into account, Putin said. “Our country confidently ranks second in the world in this area (arms market), and in the top five we are ahead of France, Germany and the United Kingdom,” Putin said at the meeting of a commission on military and technical cooperation with foreign countries. “At the same time we act in traditionally tough competitive conditions and sometimes even face misbehavior of some partners,” he said. “The portfolio of orders (for Russian arms and military equipment – TASS) is at a consistently high level, that is, more than $50 billion,” the head of state said. He noted that this year “the volume of export sales in terms of military-technical cooperation continues to be high.” “I ask military-technical cooperation entities and a state intermediary to take comprehensive measures to ensure stable demand for Russian products,” the president said, pointing to the need to pay special attention to the geographical range of supplies. “How can there be a war against a method of war,” he wonders. But they want us to fight a method and never ask the why or the who. That doesn’t seem to matter anymore. They tell us not to be concerned with why something happens, only how it happens, he replies. “The people don’t need to know why “terrorists” exist, or who they are and what motivates them, or even whether they really exist, for they are just “terrorists”, the lawyers says, referring to the phrase used by George Bush after 2001 attacks. “The War On Terror is in fact The American War Against The World,” the author states. “The Russians, when they say they are fighting “terrorism” in Syria, know that in fact they are fighting the United States and its allies and proxy forces,” he adds. The author also notes that, interestingly enough, “each set of ‘terrorist” bombings from London to Madrid, to Paris to Boston and the shootings” always end up with the claimed attackers being dead instead of arrested”. As if to intentionally conceal who is an actual mastermind of the attack. This, together with another interesting fact that many of the attacks “often occur at the same time that the police are conducting “anti-terrorist” drills” gives him a reason to suggest that “all the alleged attackers apparently have some connection to the intelligence services of the countries involved”. “The use of the word “terrorism” says nothing. It contains no useful information that can lead to an understanding of events and circumstances. It is a word used to dope the mind, paralyse thought, to sap the will. Language is an important tool of control of the people. To accept the terms of propaganda used by the powers that want to control us is to surrender to them completely because once we do that we lose the ability think rationally, to analyse, to question, to think for ourselves,” he states. “Finally, terror is an act that is used by those that can’t get what they want legitimately. Individual acts of terror, carried out by the lone terrorist or small group are carried out because they have no other political power than to try to frighten the populace. But acts of terror carried out by those factions of society that hold state power proves that they know their objectives and methods are criminal. That is why they have to resort to the terrorism of their own peoples in order to maintain control and dominance.”“If we want to eliminate terrorism in this world then we have to eliminate the conditions that bring to power those willing to use terrorism to rule,” he further says. “Maybe someone out there has the answer to all this. I don’t. But we are not going to find it, even look for it, unless we know when to call a spade a spade, and not “terrorism,” the author finally states. International political leaders have welcomed the Russian military pullout from Syria, and while many have called the Kremlin’s decision “unexpected,” it is seen as clearing the way for dialogue at a time when a truce in five-year-old war is being negotiated in Geneva. 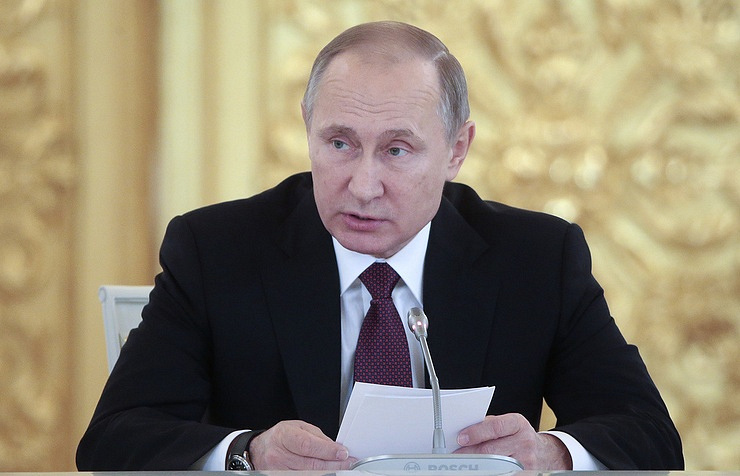 Acknowledging that five months of military campaigns have mostly succeeded in their primary objective of eliminating the immediate wider threat from Islamic State (IS, formerly ISIS/ISIL), President Vladimir Putin has ordered the partial withdrawal of Russian armed forces from Syria. Russia has placed its strategic emphasis on establishing a diplomatic effort, with Putin instructing the Foreign Ministry to intensify Moscow’s participation in organizing the peace process to resolve the Syrian crisis, which is about to enter its sixth year. After announcing partial Russian withdrawal, President Putin, explained to his American counterpart in a phone conversation that the decision will “certainly serve as a good signal to all conflicting sides and create conditions for the start of a true peace process,” the Kremlin said in a statement. The timing of the Russian decision is crucial as vital negotiations to avert further bloodshed in Syria resumed on Monday in Geneva. The last round of negotiations collapsed in January because the opposition block refused to debate their differences as Russian air raids intensified near the northern Syrian city of Aleppo. Obama welcomed the “much-needed reduction in violence” since the cease-fire took effect late last month, the White House said in a statement about Monday’s phone call. “The president underscored that a political transition is required to end the violence in Syria,” the White House added. German Foreign Minister Frank-Walter Steinmeier also welcomed Moscow’s announcement saying it will put additional pressure on parties in Geneva to negotiate a peaceful transition to end the Syrian turmoil. “This will increase the pressure on the al-Assad regime to finally and seriously negotiate a peaceful political transition in Geneva,” Steinmeier said in a statement. Comments also came from the Iranian Foreign Ministry. “The fact that a semi-ceasefire has been holding in Syria is welcome news, it’s something that we’ve been asking for at least two-and-a-half, three years,” Foreign Minister Mohammad Javad Zarif said at a meeting with his Australian couterpart Julie Bishop in Canberra. While Russia plans to maintain a military presence at its naval base in Tartous and the Khmeymim airbase, Moscow’s decision to reduce its military involvement in Syria has already been welcomed by the Syrian opposition currently negotiating in Geneva. What is also important is that the move has been well received by all members of the UN Security Council, who have been working tirelessly on the diplomatic front to secure peace in Syria. However, despite the careful timing of Putin’s announcement that is clearly aimed at cementing the fragile ceasefire in Syria, the Kremlin’s decision has been called “a surprise move,” by the New York Times, which hypothesizes that the Russian decision was conditioned by the rift between Moscow and Damascus. “There have been growing signs of differences between Russia and the Syrian government over the Geneva talks, which Moscow has pressed hard for along with Washington,” NYT wrote. In reality the Russian initiative to withdraw received full support from the Syrian government before the announcement was made. “The president of Syria noted the professionalism, courage and heroism of the Russian service personnel who took part in the military operations, and expressed his profound gratitude to Russia for providing such substantial help in fighting terrorism and providing humanitarian assistance to the civilian population,” the Kremlin said commenting on the phone call between Putin and Assad. “US officials said any withdrawal of Russian forces from Syria would come as a complete surprise and that the US government hadn’t expected Moscow to announce such a move,” WSJ said. Stratfor, a global intelligence think tank, has also used the term “unexpected withdrawal,” to describe Putin’s decision. At the same time, their report acknowledged that Moscow has achieved its stated agenda. As Russia’s Vladimir Putin announced the start of the withdrawal of Russian forces from Syria, Defense Minister Sergey Shoigu has reported the anti-terror operation’s achievements to the Commander-in-Chief. “Backed by our aviation, Syrian forces have freed 400 populated areas and over 10,000 square kilometers [3,860 square miles] of territories,” Shoigu said during a Kremlin meeting with Russia’s President Vladimir Putin on Monday. Terrorists have been forced out from Latakia and Aleppo, and Palmyra has been “blocked,” the military official reported to Putin, saying that military actions to free the UNESCO heritage site from militants continue. Hama and Homs Provinces in central Syria have been largely mopped up, and Kuweires airbase that had been besieged by terrorists for over three years was retaken. Saying that Russia’s Air Force in Syria has conducted more than 9,000 sorties starting from September 30, 2015, the Defense Minister added that for the first time massive strikes at a range over 1,500 kilometers [930 miles] with both air and ship-launched missiles have been conducted. With Russia’s support from the air, the Syrian army managed to retake control of oil and gas fields near Palmyra. Three large fields have already started functioning in normal mode, the minister added. In all, 209 oil production facilities and almost 3,000 oil delivery vehicles have been destroyed by Russia’s airstrikes. “As a result of airstrikes, terrorists’ resources’ provision has been largely cut,” Shoigu told Putin, saying that petroleum trade routes with Turkey, as well as main routes of weapons provisions to terrorists have been blocked. The Russian campaign also reduced the threat posed to Russia by Islamic militants, as over 2,000 fighters from Russia have been “eliminated” in Syria, including 17 field commanders. To strengthen the progress achieved, Russian continues the aerial monitoring of the ceasefire’s observance. “A fairly large number of unmanned aerial vehicles – over 70 – are being used for this purpose, as are all means of gathering intelligence, including electronic intelligence and our satellite constellation,” Shoigu stated. The Syrian Army has made major advances in Aleppo province, and is on the brink of surrounding the militant-held portion of the city of Aleppo, cutting off trade routes between the jihadists, Turkey and Daesh to boot. Now, Expert magazine suggests, Turkey’s hints at intervention signal that the Ankara-backed militants are running out of time. The northern Syrian city of Aleppo is the country’s second city (and before the war in Syria began, its largest). In the last few months, the situation in the city, contested by government and rebel forces, has turned 180 degrees. Moving forward, as the Syrian Army and allied local militias, plus Syrian Kurdish forces in the country’s north, move to take control of the Syrian-Turkish border, and to cut off the rebels’ supply routes with both Turkey to the north and the Daesh terrorists to the east, the regional operation is turning out to have implications for the entire Syrian theater. This, in turn, “has given impetus to all sorts of geopolitical tremors,” military analyst and Expert magazine contributor Pyotr Skarabahaty explains. “The situation is changing almost every day,” Skarabahaty writes, “but so far [Damascus and Moscow have] the strategic initiative, interfering with regional and Western powers ability to facilitate an appropriate response” to reinforce the jihadists. Unfortunately, with the Erdogan government effectively blackmailing Brussels by threatening to ‘dump’ its refugees on Europe, “the EU may decide to close its eyes on a Turkish military operation, as it has already done with the growing carnage in the Kurdish areas of Turkey.” The German chancellor’s remarks on being ‘shocked by the suffering of tens of thousands’ due to Russian airstrikes indicates that “she is willing to play this game,” Skarabahaty noted. After all, as official Damascus has already warned, “any military intervention without the Syrian government’s consent will be perceived as aggression. In this connection, invaders will have to be sent home in coffins.”At the same time, Skarabahaty warned that the danger stemming from the US’s off-again on-again, befuddled policy with regard to the conflict in Syria should not be discounted. In any case, Washington’s alliance of convenience with the Kurds, and its growing ideational conflict with Ankara have complicated things; the question is whether the US is willing to abandon the Kurds in favor of Ankara and Erdogan.